Regardless of how many hours you spend on getting the copy just right and the care you put into your creative, it will all be wasted if your emails are not delivered.Authenticating that an email was sent from a valid source has become the first step Internet Service Providers (ISPs) use in filtering spam. ISPs use authentication to verify the claimed domain name in the emails they receive. Many sources will cite that on average 95% of email being sent to the major ISPs (Hotmail, Yahoo!, Gmail, etc) is spam. That means only 5% of email is considered legitimate! Because of the staggering volume of email being sent daily to these ISPs, they will treat you as “guilty until proven innocent”. You need to work thoroughly and with diligence to prove that you are a legitimate sender. Domain Authentication is one of the first steps. Before you send a mass mail using Lasso’s email marketing functionality, check to make sure that your web developer or someone from your company has gone through the authentication process with Lasso Client Support (support@mylasso.com). Completing this step, means that Lasso has been approved to send emails on your behalf. Authentication legitimizes email senders. It is the effort to equip messages of the email transport system with enough verifiable information that recipients can recognize the nature of each incoming message automatically; and it is the means for ISPs to establish the true identity of an email sender. Lasso has incorporated performance and optimization technology which provides authentication that assists our clients with improved email deliverability. Sender Policy Framework (SPF): An authentication standard that specifies what IP addresses can send mail for a given domain. SenderID: An authentication standard that goes slightly beyond SPF by looking at the headers of the message to determine the PRA, or purported responsible address. DomainKeys: The most comprehensive authentication standard that signs each outgoing message with an encrypted key. In addition to authentication, you must also have a solid sender reputation. I like this analogy that was brought up at theAuthentication and Online Trust Alliance Summit in Boston 2007.“Think of authentication as your driver’s license and reputation as your driver’s record.” The ISP may know who you are, but if your driving record stinks because of arrests or fines, the delivery cops won’t allow your e-mail into the inbox. Domain Authentication at one point was just an email marketing “best practice”; it now has become a mandatory measure to improve your email deliverability. 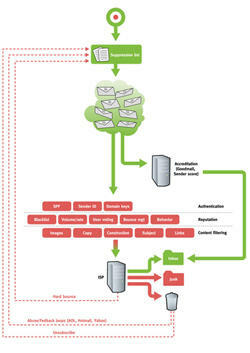 The diagram above shows the journey a marketing email travels to either get into the intended inbox, or find itself filtered into Junk Mail, or bounced back by the ISP. Prove your innocence and get authenticated!